I just wanted to catch you up on some of the stories I wrote about recently. 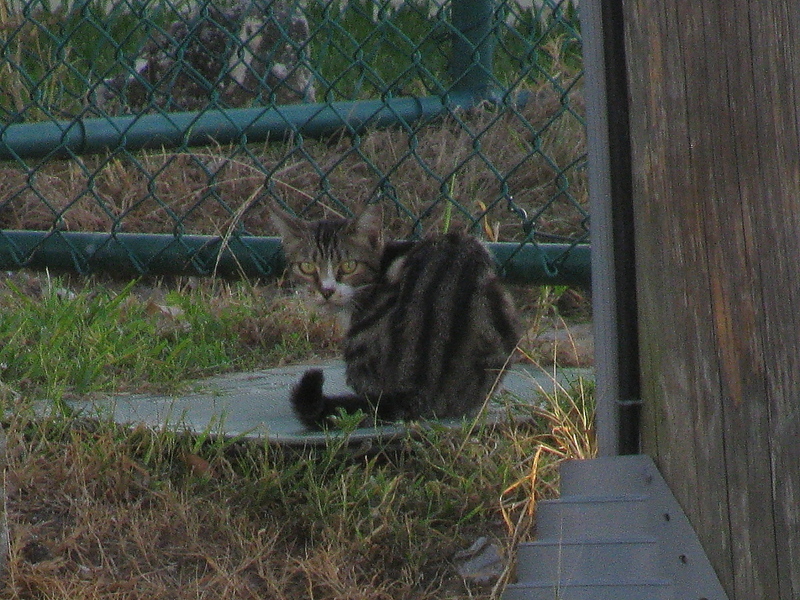 The feral cat I have been feeding at work is doing okay (see Feral Cats at Work and Feral Cat Update). I worried because he didn’t show up on Tuesday and the food went uneaten all day. I had Wednesday off and Thursday the cat was back like nothing happened. This time he left a fair amount of food behind. That tells me there is a good chance that he is either a good hunter or someone is feeding him elsewhere too. Of course, he may have also been scared off before he finished but I doubt it. In that situation, he would have backed off and waited for the person to leave but there were no people in sight when I came outside, nor was the cat anywhere in sight. Chris has pooped on our new sofa twice more since I first mentioned it (See A New Level of Badness). I stopped using the Dr. Elsey’s Litter Attractant a couple of years ago when Chris’s pooping problem stopped but I bought some again in hopes that he would leave the sofa alone. I bought it at Petco for $20 and then noticed it was on Amazon for $7.63. It has worked for me in the past but this time It made no difference. 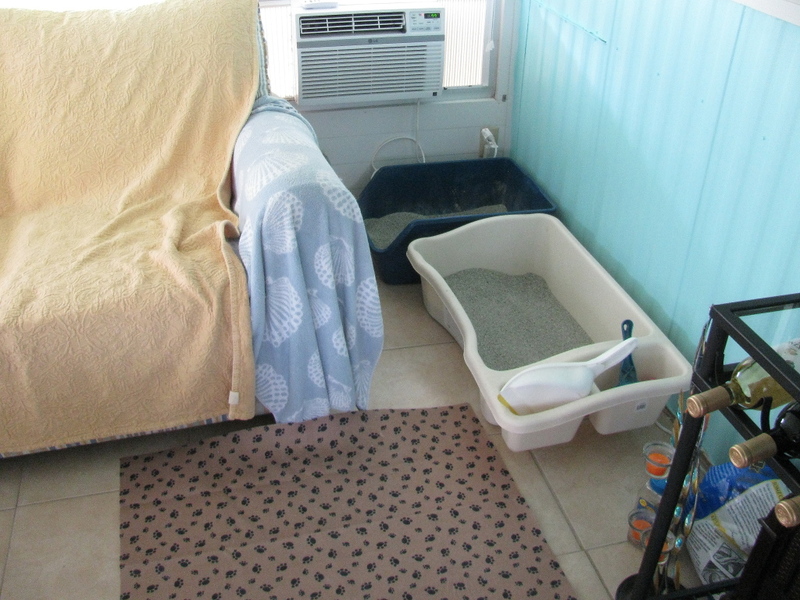 Chris is very finicky about his litter boxes and when we brought the sofa in we changed things around a little. Perhaps the space between the sofa and litter boxes was too small. It was plenty big enough for a cat to get through but who knows what goes through his mind. I decided to pull out the boxes a bit so that they were more easily accessible. It is better now but one box is still too close to the couch. So far, so good but we will see what happens. The kitten we helped rescue ( see Newborn Kitten Rescue and Kitten Update) had been doing well until recently. Rose wanted to name the cat Luis, after her maintenance supervisor who started the rescue process, but the cat turned out to be female so now she is named Lulu. Felice has worked hard to keep Lulu healthy but she has recently developed diarrhea, which can be very bad in young kittens. 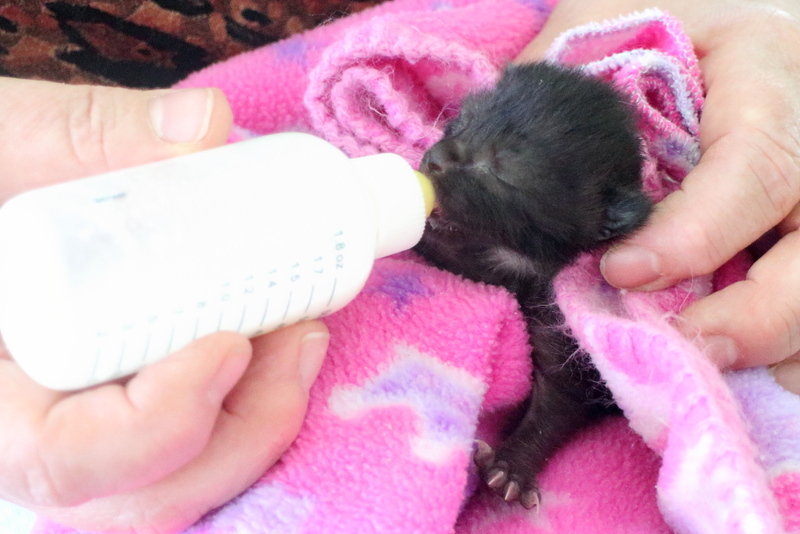 Bottle feeding a kitten is not a good replacement for mother’s milk and we can only hope she will get better. I have every confidence in Felice’s ability so I am not too concerned. Unfortunately, I have no new pictures of the kitten to share but here is one from July 4th in case you missed it. This entry was posted in Uncategorized and tagged Cats, Feral, kitten, litter boxes, poop, update on July 26, 2015 by Charles Huss. It is so good to hear from you Bev. I’m glad you are ok. I have been praying for the kitten daily and wondering how things were going- I hope he gets better. Have you tried spraying Feliway on the couch? I do that on the bed when I think of it because Sammy will poop on it after Spooky has laid on the bed. The kitty at work is so pretty, I wish you could catch him and find him a forever home. Such pretty markings. He, or she, is a pretty kitty. I have not tried Feliway yet but when I go to the pet store I will look for it. Paws crossed that Lulu gets past this problematic stage – kittens are so fragile, and diarrhea is one of those things that can really impact their ability to thrive. I also hope that you figure out a solution for Chris’s pooping issue. Usually I wonder what changed when a cat starts inappropriately relieving himself, but in your case everything has changed because you moved and all! So it’s more a matter of figuring out what to do to make the new normal work for him. Thank you. I am hoping that moving the boxes help but I may pick up some Feliway like Ellen suggests. We sure hope da kitten pulls fwu. Mommy members lots of kitties wiff da runny runs when hers used to rescue. Her specialty was bottle babies. So weez be purrayin’. Sowry ’bout da pawdee box mishap too. Me duz dat sumtimes but meez pees onda floor. 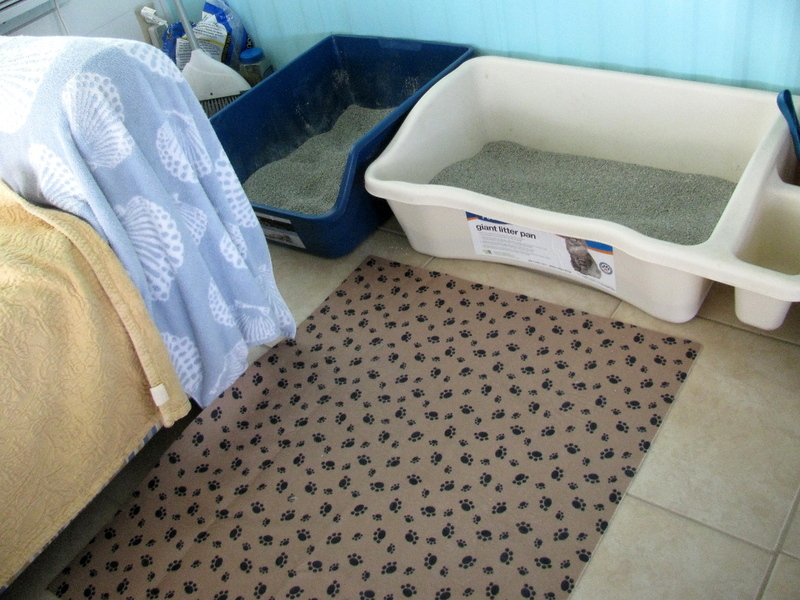 So now da pawdee box room has a floor full of piddle pads. MOL Glad da feral be okay. Have a blest day. Thanks Dezi and Lexi. Chris has alwas peed in the box but had trouble pooping in the right place. Gosh! Chris is living up to his name! Thanks for the the news too! Wes purraying tof the geral and the kitten. We bet the feral kitty is getting food some place else…which is okay because that means someone else is looking out for him. We’re purring for Lulu and hope she is better soon. 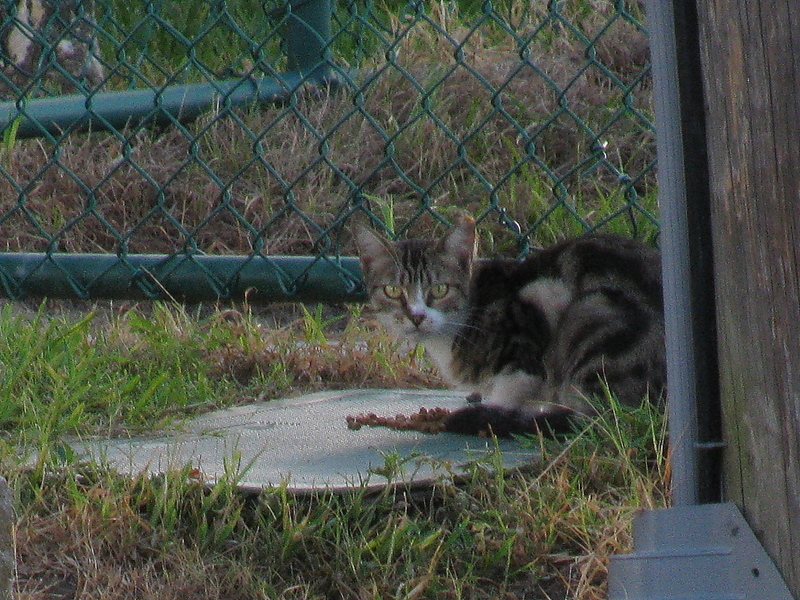 This is part three of the “Ferals at Work” story for Throwback Thursday but there are other stories mixed in, like when we helped rescue a kitten and when we still thought Chris was pooping on the sofa and hadn’t yet considered it was Puck. The kitten was adopted and I am sure she is living the good life now.